Vuforia is an Augmented Reality Software Development Kit (SDK) for mobile devices that enables the creation of Augmented Reality applications. It uses Computer Vision technology to recognise and track planar images (Image Targets) and simple 3D objects, such as boxes, in real-time. This image registration capability enables developers to position and orient virtual objects, such as 3D models and other media, in relation to real world images when these are viewed through the camera of a mobile device. The virtual object then tracks the position and orientation of the image in real-time so that the viewer’s perspective on the object corresponds with their perspective on the Image Target, so that it appears that the virtual object is a part of the real world scene. The Vuforia SDK supports a variety of 2D and 3D target types including ‘markerless’ Image Targets, 3D Multi-Target configurations, and a form of addressable Fiducial Marker known as a VuMark. Additional features of the SDK include localized Occlusion Detection using ‘Virtual Buttons’, runtime image target selection, and the ability to create and reconfigure target sets programmatically at runtime. Vuforia provides Application Programming Interfaces (API) in C++, Java, Objective-C++(a language utilizing a combination of C++ and Objective-C syntax), and the .Net languages through an extension to the Unity game engine. In this way, the SDK supports both native development for iOS and Android while also enabling the development of AR applications in Unity that are easily portable to both platforms. AR applications developed using Vuforia are therefore compatible with a broad range of mobile devices including the iPhone, iPad, and Android phones and tablets running Android OS version 2.2 or greater and an ARMv6 or 7 processor with FPU (Floating Point Unit) processing capabilities. Vuforia has been acquired by PTC Inc. in November 2015. Image Targets represent images that the Vuforia SDK can detect and track. Unlike traditional fiducial markers, data matrix codes and QR codes, Image Targets do not need special black and white regions or codes to be recognized. The SDK detects and tracks the features that are naturally found in the image itself by comparing these natural features against a known target resource database. Once the Image Target is detected, the SDK will track the image as long as it is at least partially in the camera’s field of view. Vuforia can detect words that belong to a pre-defined word list. The SDK provides a list of 100,000 commonly used English words that you can incorporate into your Text Recognition apps. You can also define custom word lists and filters that block words from being recognized. The Vuforia text recognition engine relies on the UTF-8 character encoding standard and is capable of recognising any character listed in Characters Supported by Text Recognition. Multi-targets are created by defining a relationship among multiple existing Image Targets using the Vuforia Target Manager or by directly manipulating the Dataset Configuration XML file. The spatial relationship of the individual parts is stored in the XML file using simple transformations. VuMark is the next generation bar code. It allows the freedom for a customized and brand-conscious design while simultaneously encoding data and acting as an AR target. VuMark designs are completely customizable, so you can have a unique VuMark for every unique object. The VuMark provides a universal solution for delivering unique AR experiences on any object, while allowing the design freedom for a custom look and feel. The VuMark also provides a simple method for encoding data such as an URL or a product serial number, and overcomes the limitations of existing matrix bar code solutions that do not support AR experiences and can detract from a product’s appearance. VuMarks have application in both the enterprise and consumer markets. VuMarks are a game changer for the enterprise because they offer a scalable way to identify objects and overlay 3D step-by step instructions that indicate how to use them. This leads to significant cost savings for employees operating and servicing equipment. In the consumer market, VuMarks offer a reliable way to recognize and track toys, electronics, and tools. Consumer brands can create 3D experiences that are designed to show how to use the product or to add value with new digital features. VuMarks provide some of the same capabilities as Vuforia ImageTargets, in that they can be individually recognized and tracked by the Vuforia SDK. Both can be used to create rich Augmented Reality experiences. But there are also significant differences that make VuMarks especially useful for many enterprise and consumer applications. The same VuMark design can be used to encode a range of unique IDs or data. This is especially useful when you need to be able to use the same image universally, yet need for that image to possess a unique identity and/or information. It is a valid and cheaper alternative to Vuforia. Recognize and track a common 3D object with textures in real time. The object may have different shapes and structures. Highly efficient and simple content recording solution. Showcase the most compelling AR content with additional features. Build amazing location-based, marker or markerless Augmented Reality experiences with the Wikitude SDK. Enterprises, agencies and independent developers benefit from Wikitude’s tools to develop AR apps for Android, iOS, Smartphone, Tablet, Smart Glasses. Unity, Cordova/PhoneGap, Titanium, Xamarin – Wikitude has you covered! The Wikitude SDK embeds in-house built image recognition and tracking technology, which can be used out of the box. It works with up to 1000 images that can be recognized offline. Developers can switch seamlessly between augmenting recognized images and geo-located points of interest within the live camera image. 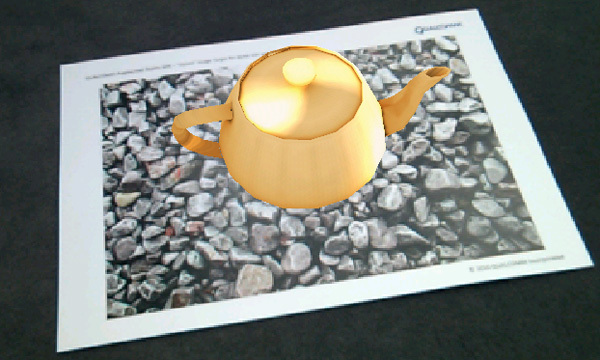 The Wikitude SDK can load and render 3D models in the augmented reality scene. Import your 3D model from your favourite tool like Autodesk® Maya® 3D or Blender. Every 3D model Based on the new Native API, Wikitude offers a plugin for Unity3D so you can integrate Wikitude’s computer vision engine into a game or application fully based on Unity3D. Wikitude’s Cloud Recognition service allows developers to work with thousands of target images hosted in the cloud. Wikitude’s technology is a scalable solution with very quick response time and high recognition rate. Includes 1,000,000 scan calls to the cloud service per month in each. Dedicated server options and custom offering available for enterprises. ARToolKit is an open-source computer tracking library for creation of strong augmented reality applications that overlay virtual imagery on the real world. Currently, it is maintained as an open-source project hosted on GitHub. ARToolKit is a very widely used AR tracking library with over 160,000 downloads on its last public release in 2004. In order to create strong augmented reality, it uses video tracking capabilities that calculate the real camera position and orientation relative to square physical markers or natural feature markers in real time. Once the real camera position is known a virtual camera can be positioned at the same point and 3D computer graphics models drawn exactly overlaid on the real marker. So ARToolKit solves two of the key problems in Augmented Reality; viewpoint tracking and virtual object interaction. ARToolKit was originally developed by Hirokazu Kato of Nara Institute of Science and Technology in 1999 and was released by the University of Washington HIT Lab. In 2001 ARToolWorks was incorporated, and v1.0 of the open-source version of ARToolKit was released through the HIT Lab. ARToolKit was one of the first AR SDKs for mobile, seen running first on Symbian in 2005, then iOS with the iPhone 3G in 2008, and finally Android as early as 2010 with a professional version by ARToolWorks later in 2011. ARToolKit was acquired by DAQRI and re-released open-source starting at version 5.2 on May 13, 2015,including all of the features that were previously only available in the professional licensed version. Among these features are mobile support and natural feature tracking. Complete access to the computer vision algorithm allows you to modify the source code to fit your specific application. Freely distributed for use under a LGPL v3.0license. Compiled SDKs for iOS, Android, Linux, Windows and Mac OS X all ready to download and use. ARToolKit includes stereo and optical see-through support, is integrated with a range of smart glasses, and allows easy calibration for new devices. Kudan is a professional technology lab researching / engineering Computer Vision algorithms, established by a serial entrepreneur Tomo Ohno in 2011. The team has been hand-picked due to their specific capabilities within the Computer Vision arena. Headquartered in Tokyo, Kudan has technology centre in Bristol, UK, with sales and support covering the global market. Kudan partners with semiconductor companies and OEMs worldwide to create next generation embedded vision for all the autonomous and interactive IT solutions, such as AR/VR, autonomous car, robotics, and drone. To date, Kudan’s Computer Vision technologies has been delivered to 20k+ licensees for wide rage of diverse and markets. Computer’s “eye”, camera, has been way better than human’s eye for so many years. However, computer’s “vision”, computer vision algorithms, is still primitive and far from the level of human’s, due to the fundamental of the algorithms. In order to accelerate the evolution of applied technologies of Computer Vision, Kudan focuses on developing fundamental modular algorithms, and designing versatile architecture enabling optimisation and acceleration on processing architectures, to be the fundamental IP in the industry. Through all camera equipped devices, Kudan’s technology will realise true “vision” for computer, to support all the autonomous and interactive IT solutions. MAXST AR SDK is an easily operated all-in-one solution with 5 key functions. Even in various challenging conditions such as fast camera movement, partial covering of the image target and zoom-in-out, the digital overlay stays in place robustly without jittering. Extended tracking and Multi-target tracking are supported. You can track the target as far as the camera can see it and can also track up to 3 images at the same time. Build your immersive AR experience using various kinds of items such as 3D models, 3D animations and videos including transparent ones. This plane-seeking engine instantly finds out a horizontal plane in the scene presented by the camera and enables you to track and place digital objects in relation to the plane. You can empower your app to augment any random space without any pre-prepared targets or maps. The powerful algorithm based on VIO(Visual Inertial Odometry) works well in featureless plane and continuously keeps track of the camera move and thus helps digital overlays stay in place even when they are out of the camera view. MAXST Visual SLAM is optimized for mobile uses and works great on most devices with just a single RGB camera. You can map and track the surroundings at the same time. And the map is automatically extended beyond the first view along with the move of the camera. You can save maps for later uses. Try a more exquisite AR project with MAXST Visual SLAM. With Object Tracker you can load up map files created and saved with Visual SLAM and render 3D objects wherever you like on it to create more immersive AR experiences. Empower your app to read QR code and barcode. An open-source library, zxing-cpp is used. MAXST AR SDK combines 5 AR capabilities. Choose one that best fits your AR project and bring your AR imagination to life. A wide array of platforms including Android, iOS, Mac OS and Windows are supported. You can choose Unity plug-in formats, too. You can bring in static 3D models, 3D animations, and videos as well as 2D images to lay on image targets. The occlusion empowers you to design more immersive and realistic AR experiences. MAXST AR SDK supports the calibration tool for various wearable smart glasses such as Epson Moverio, ODG etc. The calibration process allows every user to get his own personalized profile and to fine-tune the displays to have more immersive AR experiences. Genesis Virtual Guide is a modern take on the traditional owner’s manual, providing convenient, simple ways to become familiar with full vehicle capabilities. Virtual Guide uses advanced augmented reality to display key information about various components and features of the luxury sedan. Among the various functions, it’s the engine room part where MAXST AR SDK proves its real worth. If a user opens the Genesis Virtual Guide and holds the smartphone over the engine bay, the app brings up a digital overlay that provides how-to information on maintenance for each crucial part. MAXST AR SDK’s Visual SLAM and Object Tracker were used in scanning and mapping the 3-dimensional structure of the engine bay and putting the digital overlays right in place in exact alignment with real engine parts. XZIMG provides customizable HTML5, desktop, mobile and cloud solutions with the objective of extracting intelligence from images and videos. XZIMG provides a high quality fiducial markers and images tracking technology which is robust, real-time and multi-platform. Augmented Vision generated experiences can be deployed on PC (Windows), Mobiles and HTML5 compliant browser through a user friendly Unity plugin system. XZIMG provides high quality deformable face tracking technology which is robust, real-time and multi-platform. The solution is ideal for face replacement and make-up based applications. Magic Face experiences can be deployed on Desktop (Windows), Mobiles and HTML5 compliant browsers through a user friendly Unity plugin or native samples.